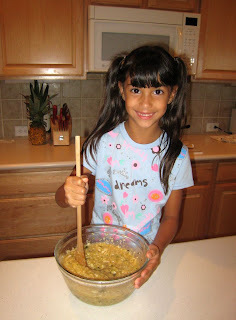 This week, it's Faith's turn for The Kids Cook Monday project. I found this recipe via a Twitter friend and knew we had to try it, it's for Garden Fresh Zucchini Bars! 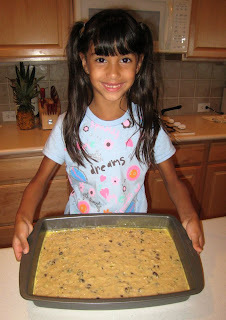 We do like zucchini bars/muffins/cookies, and it seemed like a great entry for our "slightly healthier" dessert series. Plus how can you possibly go wrong with coconut and raisins? 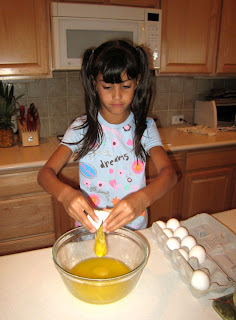 Unlike her brother, Faith is more than happy to crack the eggs, I think it's her favorite part. She's also able to read the recipe which is much nicer when I'm in the pantry trying to remember why I was in there in the first place. Stirring it all up, getting ready to blend in the flour, it looked so good! And voila! One pan of bars, ready to go! Yummy! I love anything with zucchini in it! I will have to add this to our list of things to try :D Faith looks like an awesome helper! I love anything baked with zucchini also. Would never entertain the idea of eating it by itself but it's oooh soo yummy baked into breads/cakes/muffins!